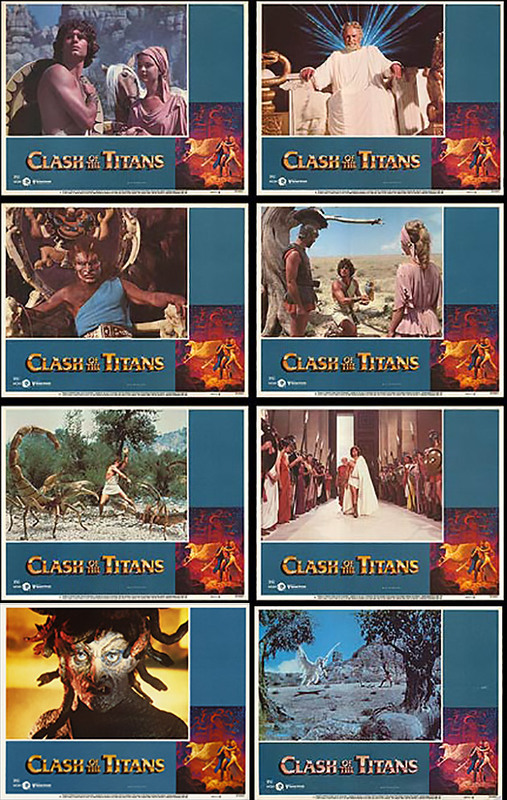 US lobby cards set for CLASH OF THE TITANS (1981). This set is missing some big moments, including the Stygian Witches and no cards with Maggie Smith or Ursula Andress, etc. Good selection but somewhat lacking. Interesting, that Zeus and Calibos are sitting in the exact same position. The photo showing Perseus fighting the scorpions is probably the most widely spread image from Clash of the Titans, and it's the one that drew me into the film when I first discovered it. It was on the back of the Swedish VHS rental edition. Still, having lobby cards of that movie would be AWESOME!